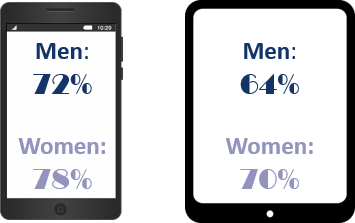 Women use their smartphones and tablets more than men use theirs. Not surprisingly, those women use their mobile devices for the purposes of finding financial information and the advisors who can help them make sense of their financial information. Our white paper High Net Worth Men Vs. Women details the differences in the investment and financial advice aspects of the lives of affluent investors based on gender. The white paper includes the use of social media and mobile technology in the process of making financial decisions. Spectrem’s upcoming quarterly wealth segmentation series study Using Social Media and Mobile Technology in Financial Decisions expands on the use of websites and smartphones by investors to find and work with advisors. More than 70 percent of High Net Worth investors use a smartphone, and just under 70 percent of investors use a tablet. But High Net Worth women are more likely to do so in both cases, with 78 percent of women using a smartphone and 70 percent of women using a tablet. When investors use mobile technology, they often do so to visit social media websites, and that is where women are more likely to find their financial information. Women are more likely to choose a financial advisor or provider who uses social media to communicate with their customers and market their products, and they are more likely to use a financial product or service advertised on social media. High Net Worth women are also more likely to be on social media websites. The difference in the use of Facebook, specifically, is significant (71 percent to 54 percent). High Net Worth women are more likely to use an advisor than High Net Worth Men (78 percent to 61 percent). Among those using an advisor, women are much more likely to use an accountant or attorney as their financial advisor, and also have a much greater lean toward Full Service Brokers than men have. High Net Worth women report a slightly greater satisfaction with their advisor than High Net Worth men, but they are also more likely find a good reason to fire their advisor. Women are especially dissatisfied when an advisor does not return phone calls in a timely manner, and are not proactive in making contact when an investment possibility or problem arises. When advisors and investors meet for the first time, there are dozens, if not hundreds of questions to be asked and answered to determine the attitudes and concerns the investor has regarding investment strategies. It is advantageous for advisors to understand the approach women prefer as opposed to the approach men like to take, and then to be able to adjust accordingly based on responses regarding contact and conversation frequency, as well as the use of social media and mobile technology for making contact and having conversations.